First place to start, is the steak marinade. Either the night before, or a coupe hours before dinner you’re going to want to put the marinade on your steak. This will take all of 5-10 min, and when you’re finished, just wrap it tightly and set it in the fridge until you’re ready to cook it. 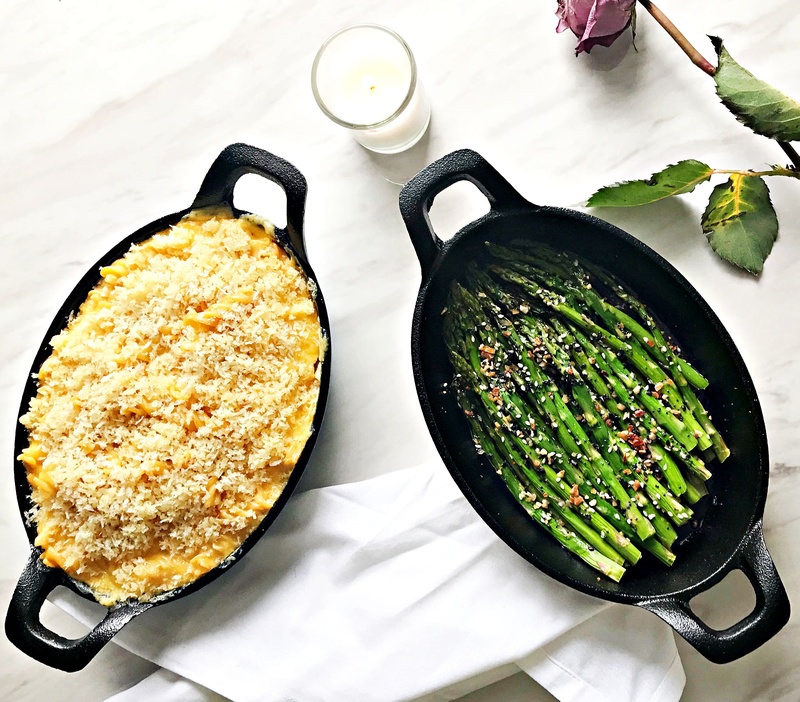 Depending on your time or how you want to set up dinner, the side dishes can be made right before serving, or prepared ahead of time, and then baked in the oven 30 minutes before serving. Let’s start with the seasoned asparagus first! Prep work for this is very minimal, and really just requires assembly. 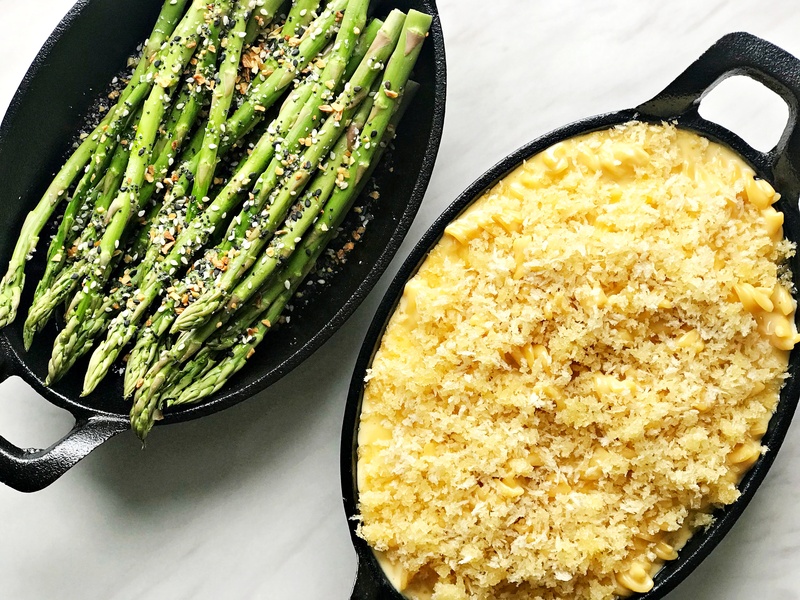 Make sure to rinse your asparagus spears, trim the bottoms off and then lay in a greased baking dish. Drizzle with oil and season with Everything But the Bagel Seasoning, cover with foil, and set aside. If being prepped more than an hour before baking, store in the fridge. Next is the mac and cheese! Make sure to cook your noodles before starting the cheese, that way you can stir them in as soon as the cheese is ready! If you let the cheese sit for too long it will start to harden, and then you have to go through the process of heating it up again, which is just a pain! Once you add the panko crust topping, cover with foil and set aside, or store in fridge if prepped more than an hour before baking. A tip to save you time…cook your noodles the night before and store in a air tight zip lock bag in the fridge. 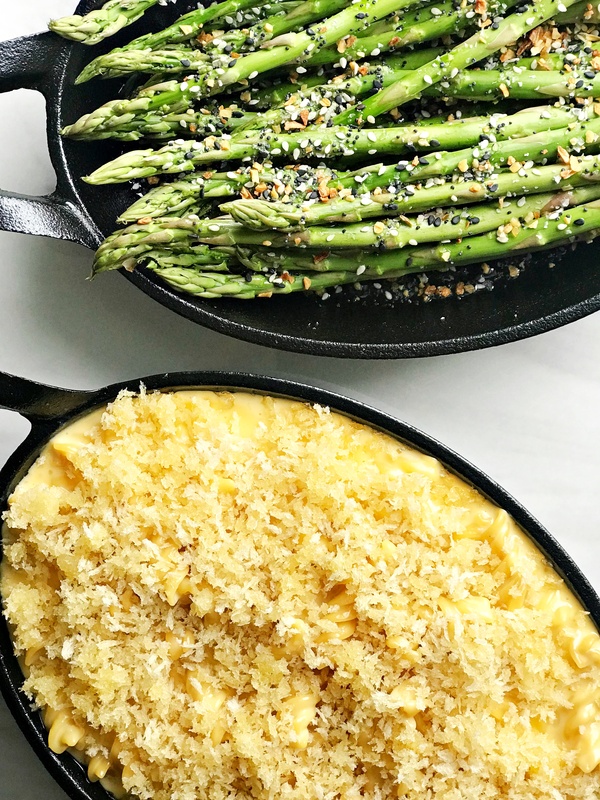 45 min before the estimated dinner time, preheat your oven to 350 degrees F. When the preheat is finished, pop the side dishes in and bake for 30 min. Cover both with foil for first 20 min, then remove for last 10. While side dishes are baking, pour yourself a nice glass of wine to sip on, because you’re dinner is almost done! Last step…cooking the ribeyes! 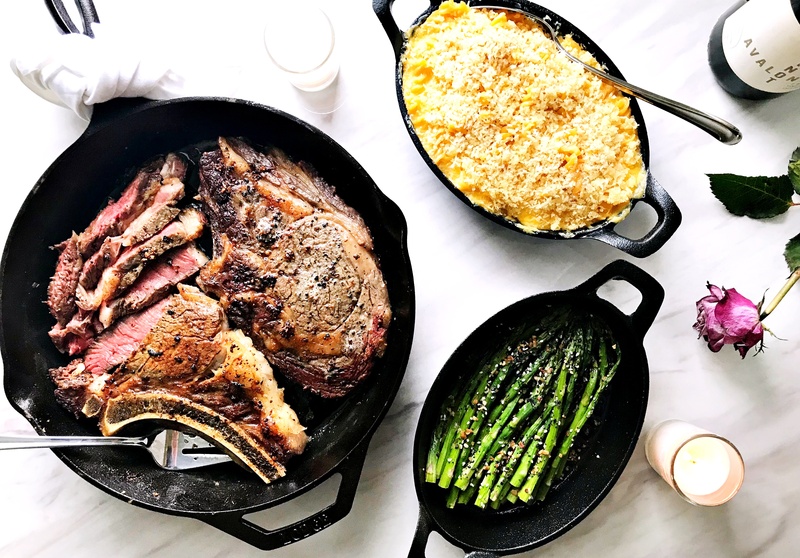 Remove your ribeyes from the fridge and set on the counter. Take a large frying pan or skillet and add butter. Set to medium-high heat. 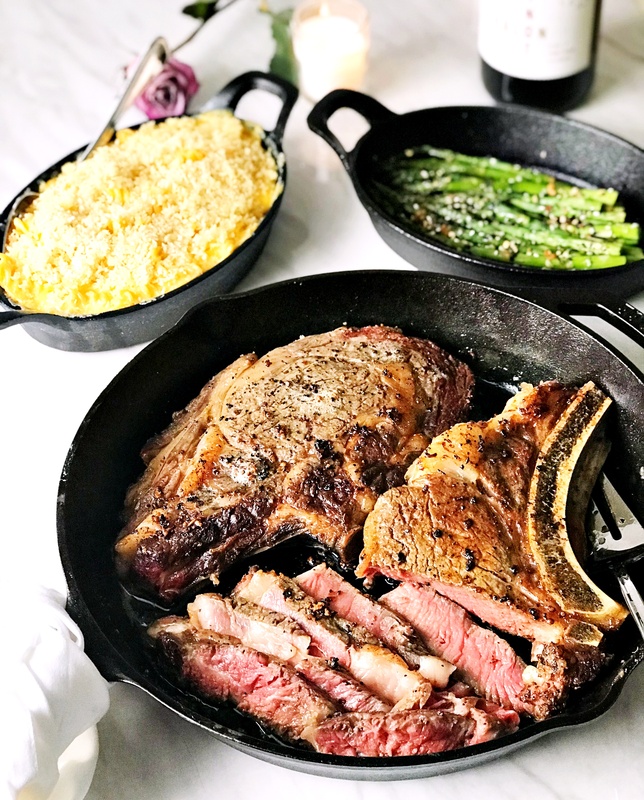 Once the butter is melted, begin searing your ribeyes. This will take anywhere from 7-15 min. 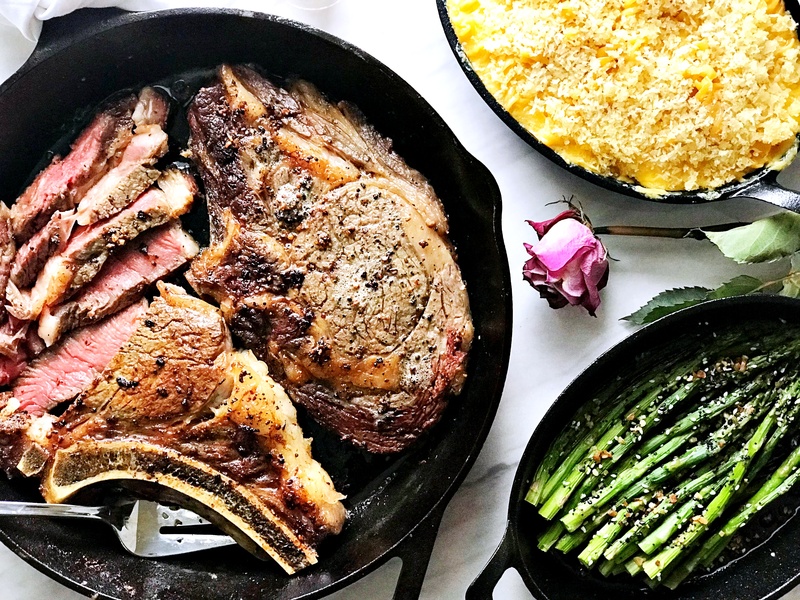 By the time your steaks are done, your side dishes will be finishing up in the oven! Serve however you like and enjoy! Lay out all of your ingredients ahead of time, as the sauce will need to be stirred while cooking to prevent hardening or burning. Prep the cheeses by cutting them into thin slices (that way they melt in the saucepan quicker). Allow cream to get close to room temp, to avoid curdling. Once ingredients are laid out, add butter to saucepan over medium heat. Allow to melt and then whisk in flour. Slowly pour cream into saucepan in stages, while continuously stirring. This will thicken and create the roux for your cheese sauce. Once you have added all the cream and created your roux, start to add the cheeses and continually stir. Add cheese in stages (a handful of velveeta and cheddar at one time). Stir in cheese until it melts, then add another handful until everything is blended together. Sprinkle in nutmeg and stir. Add most of your cooked noodles to the cheese sauce and stir (I leave out a handful of noodles so it's extra creamy!). Melt butter in a separate bowl and stir in 1/2 cup panko. Take panko mixture and sprinkle on top of mac and cheese. Bake for 30 min with foil on top for first 20 min. I use Vermont Sharp White Cheddar by Cracker Barrel for my choice of cheddar. Rotini pasta is my favorite to use with mac and cheese, because I find that its shape is best for grabbing the sauce. 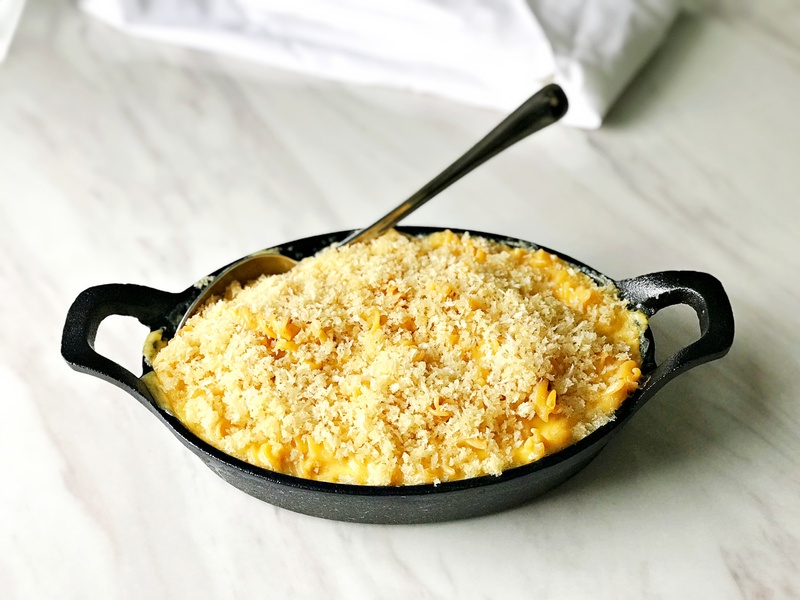 Up next on the Valentine’s Day dinner menu is THE BEST Creamy Macaroni and Cheese! This is one of those classic dishes that will never get old and keeps the heart, soul, and taste buds happy 🙂 It pairs nicely with any greens (whether it be a salad or veggies), and is actually a simple recipe to make! In this case, it pairs nicely with Seasoned Asparagus ! 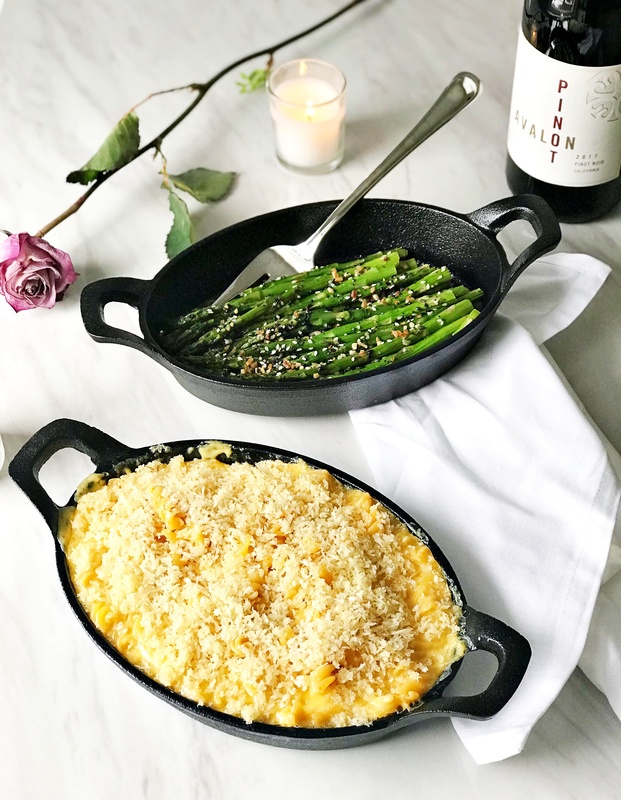 If you want to make a creamy mac and cheese for your v-day dinner (or for any occasion), there are three simple steps you should follow every single time! Shall we get started?! Start with a roux: “roo” is French in origin, meaning “browned butter”. It sounds scary and complicated, but it’s actually a simple cooking method used to thicken sauces! 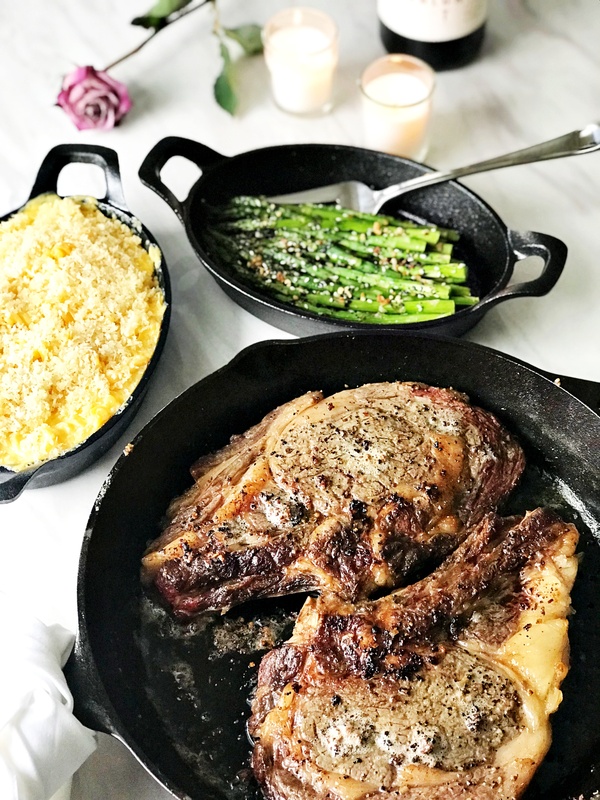 It’s created by adding equal parts flour and fat (for this recipe, I use 2 tbsp grass-fed butter and 2 tbsp almond flour) to a heated pan and whisking the ingredients together. In order to blend the flour and butter, you must melt your butter in the heated pan first, then whisk in flour. Once the roux is made, your next step is to take cream and slowly add it to your roux. The best way to do this is in stages, approximately 1/3 cup at a time, while constantly whisking. You will notice the cream start to thicken as you stir, all thanks to that roux! This will act as your base for the cheese sauce to make sure it doesn’t become runny or thinned out over the noodles! Stir cheese in slowly: in order to prevent cheese from burning, the best thing you can do is add cheese to your roux in stages and whisk constantly. This not only helps prevent burning, but melts the cheese faster due to constant distribution of heat. 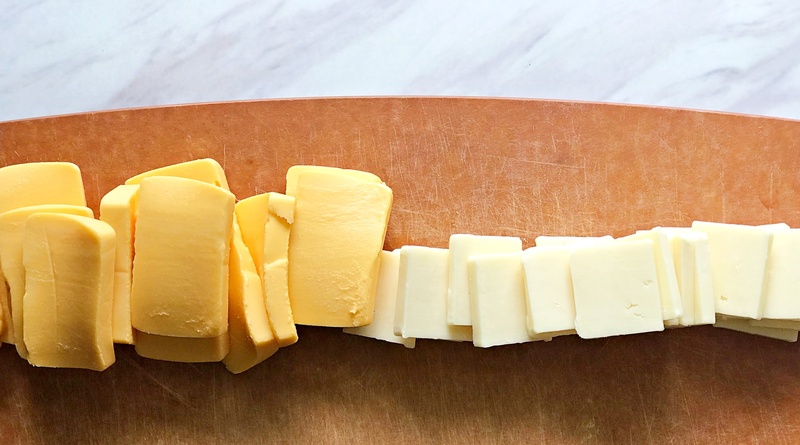 In order to add cheese in stages, I cut my cheese into slices (as pictured below) and add a couple pieces of each kind at a time. Add extra flavor: get creative and give your mac some personality! Even the “plain” recipe needs a little something, something…and for that I use Nutmeg! 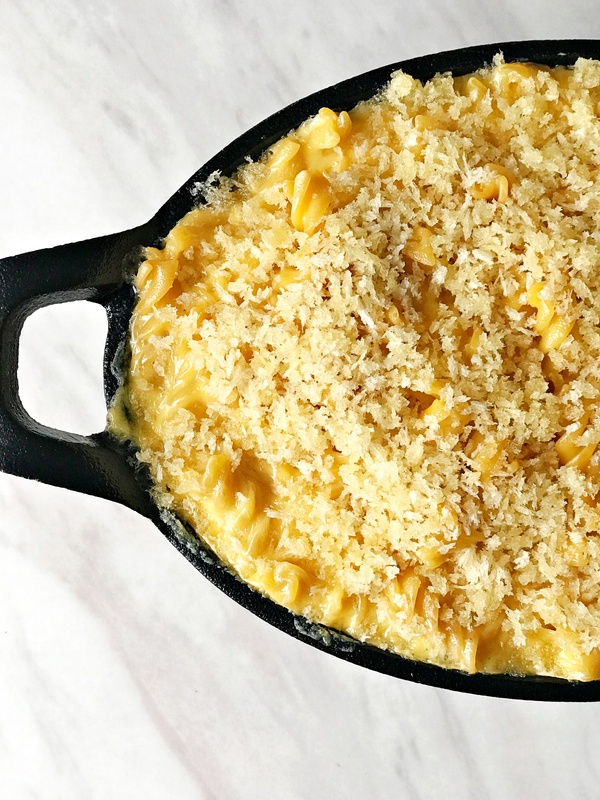 A little bit of fresh ground Nutmeg makes a world of difference and you’ll never go back to regular mac and cheese again. Or if you want to take a walk on the wild side, stir some bacon and chives into your sauce before adding noodles! Or lobster, or BBQ pulled pork, or hot sauce…omg the options are endless! Whatever flavor floats your boat, just make sure to stir it into your sauce before adding in noodles! Once your cheese sauce is made, noodles stirred in, all that’s left is to add a panko topping and bake for 30 min. For panko topping I melt 2 tbsp butter, then stir in 1/2 cup panko so that it soaks up all the butter. Top your mac with the panko/butter mixture to give the dish some texture. 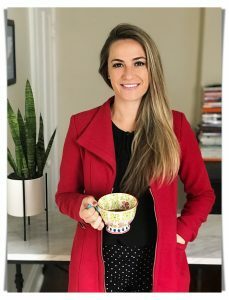 Have you made this recipe?! If so, comment below or hashtag #lulustable on Instagram to show me your homemade creation! I’d love to see what you’re doing in the kitchen! Follow @lulus.table on Instagram for more recipes as they get posted.